Employment Sunshine for Florida? | carrieblanchard, ph.d. Finally. There is reason for optimism in Florida’s employment future. In addition to the recent decline in the unemployment rate to 11.5 percent, there are currently over 240,000 jobs posted online to be filled in the Florida economy. Of the positions advertised online in March, 71% are full-time employment opportunities, with positions for registered nurses, retail salespersons and physical therapists as the top advertised occupation categories. 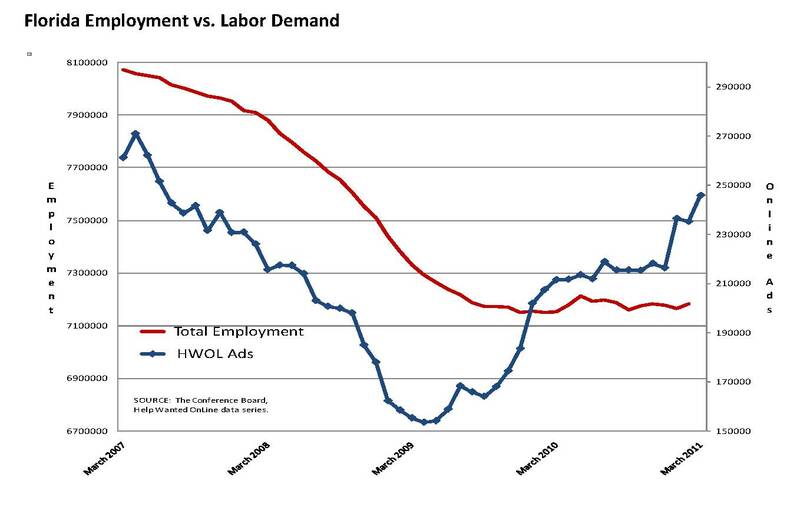 On the national level, a similar uptick in employment is underway. The United States Labor Department reported that 3.1 million jobs were advertised in February, which is the most since September 2008. And with the employment freefall stabilized there is a strong likelihood for improvement in other sectors of the economy, such as consumer spending and home sales. Also, with projections signaling economic growth at both the national and state level into 2012, all eyes should be focused on the one element that could significantly stall forward progress – the price of oil.